I would like to take this opportunity to say how much we appreciate you providing the Airport Ambassador Program with the San Antonio Guide Maps. Our Ambassadors distribute the guide maps to our tourist and local residents meeting and greeting at San Antonio International Airport. happy to distribute as many as you can provide us. I am very pleased to have received a new batch of San Antonio Map Guides. They surpass, if possible, your preceding guides. They are very attractive and seem to grab the attention of our guest. Here at the Sheraton Gunter Hotel, these guides are very poplar amongst both my clientele and my associates. It is a great way for us to show our guests exactly where their destinations are located and very easy for our guest to follow. They are also full of San Antonio's most popular spots. As Concierge of this establishment, I feel I must express my thanks on my own behalf as well as on the behalf of our guests and my associates. Please keep us in mind when handing out any future guides and thanks again. Thank you for supplying the Hotel Contessa with iMAP San Antonio maps. They are being snapped up like hot cakes. The format is easy to read and helpful to our guests. The pull-out discount coupons are also a popular bonus. 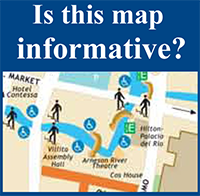 I particularly like all the Riverwalk access areas for the disabled being marked on the map. Uniquely San Antonio. Uniquely Contessa.